he tradition of horary prayers (particularly Complet) is still cultivated for certain occasions today at the Evangelical Seminary, supporter of the cloister concerts and the Maulbronn Chamber Choir. It therefore stands to reason that the liturgical form of the horary prayers be transfused to a musical, clerical programme. Of course, it is not possible to feature the complete horary prayer texts as choir compositions. In such, the programmes concept is based on the adoption of integral liturgy components from every horary prayer by textually identical or paraphrased choir compositions. Each horary prayer contains an hourly text, a psalm prayer, and a canticle from the New Testament. Thus, Zacharias Benedictus or the Te Deum is the designated canticle in the morning prayer; the vesper includes the Magnificat (Marias canticle), and the canticle in Complet is Simeons canticle (Nunc dimittis). The programme implies particular suspense by posing 19th century compositions vis-à-vis stylistically contrary 20th century compositions and monophonic orthodox cantos. Whereby Arvo Pärt has limited himself to few harmonies in Magnificat and is very frugal with musical sources (minimal music) while assuming a vertically definitive harmonic and sensitive tone altogether, a strict contrapuntal linearity dominates Rolf Schweizers composition, which is primarily disposed to the consequent perfection of every individual voice, and in such, is subordinate to the vertical, harmonic aspect. Rolf Schweizer is of particular rigour in the imitative-rhythmic area in his composition O lux mentium, but keeps the piece in tonal balance with the rather homophonic insertions (O Lux). The composition Hear my prayer, O Lord by the contemporary Swedish composer Sven David Sandström is a different type completely, and is based on a piece by the English composer Henry Purcell of the baroque era. Sandström adopts Purcells composition literally and in the middle of the piece, transports it very sensitively to his own modern tonal prose. Sandström is concerned with a very expressive interpretation of the text Hear my prayer, O Lord, and give ear to my cry". After an initial reserved, lamenting tone, the piece gradually mounts until it ultimately climaxes in an outmost dramatic, existentially affected outcry in which the praying man calls out his desperation (soprano to C). Fierce dissonances and extreme dynamic make his emotional condition clear, but after a while, the piece is gradually restored and finally ends with the most delicate pianissimo and a pure C-major triad (bass to low C). The praying man gradually calms down and surrenders to the Lords guidance with hope and trust. 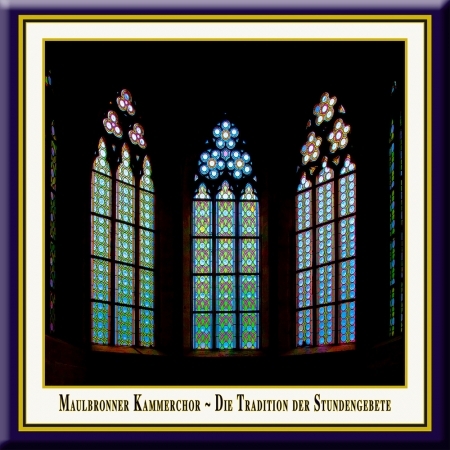 he Maulbronn Chamber Choir (German: Maulbronner Kammerchor) was founded in 1983 and counts today as one of the renowned chamber choirs in Europe. Awards like first places at the Baden-Württemberg Choir Competitions in 1989 and 1997, second place at the German Choir Competition in 1990, first prize at the German Choir Competition in 1998, second place at the International Chamber Choir Competition in Marktoberdorf 2009 and first place at the Malta Choir Competition show the extraordinary musical calibre of this ensemble. The Chamber Choir has managed to make quite a name for itself on the international scene, too. It was received enthusiastically by audiences and reviewers alike during its debut tour through the USA in 1983, with concerts in New York, Indianapolis and elsewhere. Its concert tours in many European countries, in Israel and Argentina as well as in South Africa and Namibia have also met with a similar response. The choir has performed oratorios by George Frideric Handel each year annually since 1997. All these performances were documented on disc; because of that the Maulbronn Chamber Choir holds a leading position internationally as an interpreter of this genre. rof. Jürgen Budday (born 1948) is a German conductor and director of church music. His musical focus lies in historical and contemporary vocal music and in historically informed performances of oratorios, masses and other sacred works. He studied music education, church music and musicology at the Academy of Music in Stuttgart from 1967 to 1974. From 1979 to 2012, he taught at the Evangelical Seminar in Maulbronn, a Protestant boarding school at the UNESCO World Heritage Site Maulbronn abbey with famous former students like Johannes Kepler, Friedrich Hölderlin and Hermann Hesse, and led, from 1979 till 2013, the concert series at Maulbronn monastery as artistic director. In 1992, Jürgen Budday was named Director of Studies, in 1995 came the appointment as Director of Church Music and in 1998 he was honored with the Bundesverdienstkreuz (German Cross of Merit) as well as the Bruno-Frey-Prize from the State Academy in Ochsenhausen for his work in music education. In 1983 Budday founded the Maulbronn Chamber Choir (Maulbronner Kammerchor), which he conducted until June 2016 and with whom he has won numerous national and international awards. At the Prague International Choir Festival, for example, he received an award as best director. Since 2002, Budday has also held the chair of the Choral Committee of the German Music Council and became director and jury chairman of the German Choir Competition (Deutscher Chorwettbewerb). In 2008, he received the silver Johannes-Brenz-Medal, the highest honoring of the Evangelical-Lutheran Church in Württemberg, following by the awarding with the honorary title Professor in 2011. In May 2013 Prof. Jürgen Budday was awarded by the Association of German Concert Choirs with the George-Frideric-Handel-Ring, one of the highest honors for choir conductors in Germany. Thus Jürgen Budday followed Helmuth Rilling, who was honored with the ring from 2009 till 2013.
at Maulbronn Monastery in Germany, 1999.